Isobe Onsen is located in Annaka. It is known for being the birthplace of the sign used to designate a hot spring on maps and such. 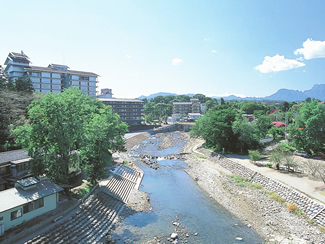 Isobe Onsen was a post town frequented by both travelers and the local people. Situated along the Usui River, the beautiful view of Mt. Myogi and its convenient location attract a great number of tourists to Isobe Onsen throughout the year.